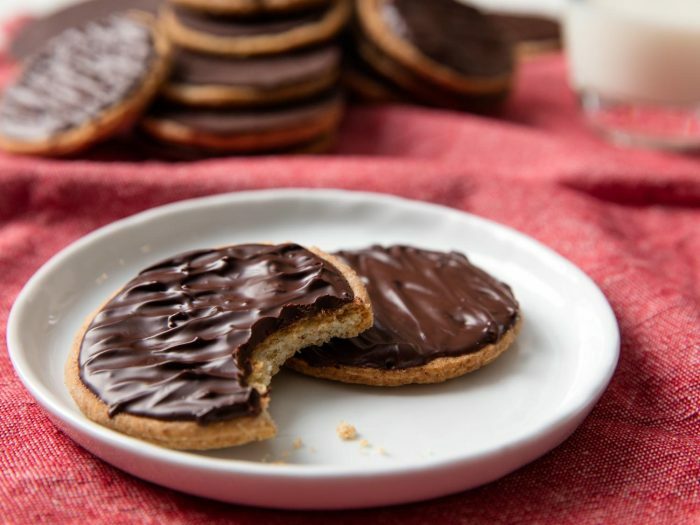 It is National Biscuit Day, how about trying this chocolate digestive biscuit recipe? Heat the oven to 180°C, 160°C fan, gas mark 4. Mix the flour and butter together until breadcrumbs form. Add the bicarbonate of soda, sugar and salt and mix. Add the milk till a dough forms. Wrap in cling film and chill for 30 minutes in the fridge. Roll out the dough and cut out 12 biscuits. Bake for 12-15 minutes until brown on the surface. Take out and cool. Melt the chocolate and cover one side of each biscuit in the chocolate, leave to set. Next PostNext Mediterranean Tomato Chicken or BBQ Chicken?